Catching a foul ball at a baseball game is a thrill for any fan. And with pitchers throwing faster, batters taking bigger swings, and juiced ball rumors, foul ball catches for fans are more difficult than ever. Sometimes, however, the fans in the stands make catches that overshadow anything the highest-paid players do on the field. These are the top 11 MLB foul ball catches by fans. We’ll see a double catch (page 8) and an impressive fielding display (page 9) as we count down to No. 1. 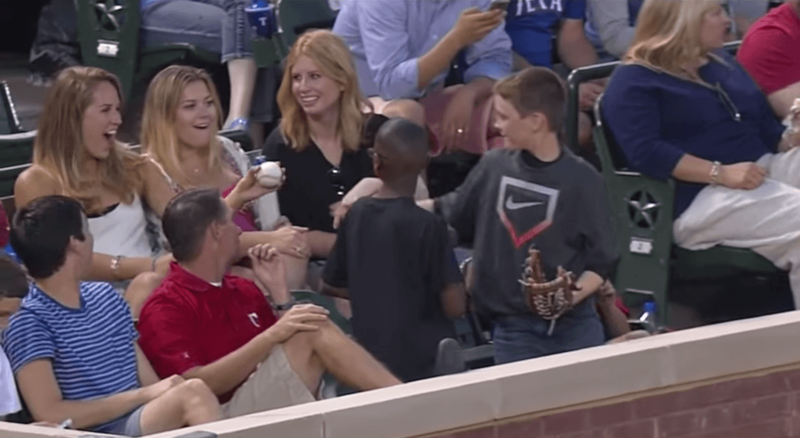 What happened: Technically this isn’t a foul catch, but a young Texas Rangers fan makes a smooth move with a foul ball thrown to him by a third base coach. 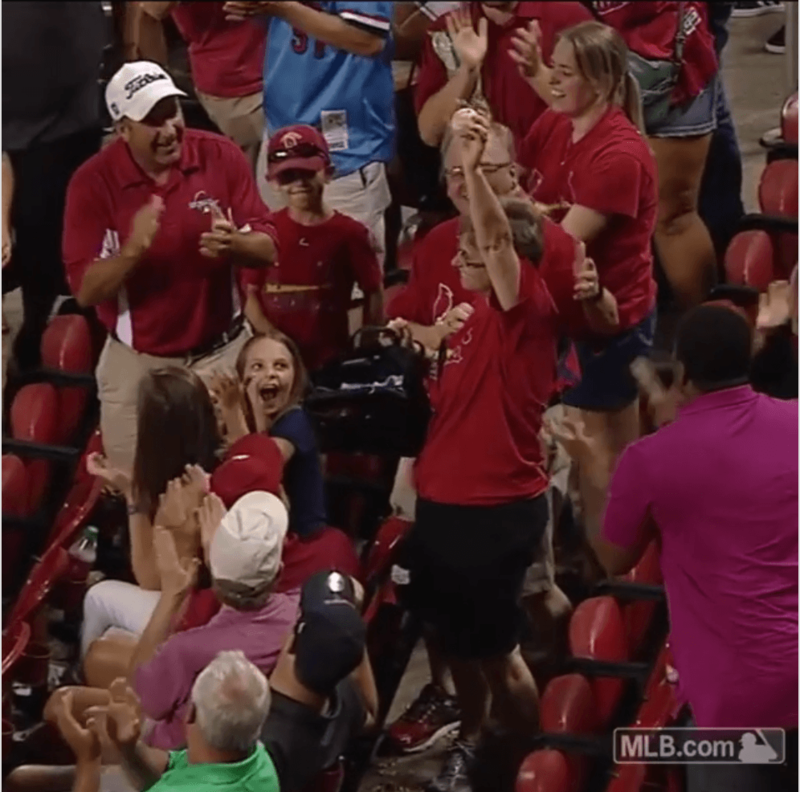 The fan already has a ball in his hand, and after he catches the ball from the coach with his glove he hands the first ball to a female fan sitting behind him. She is very flattered, as you can see in the video. 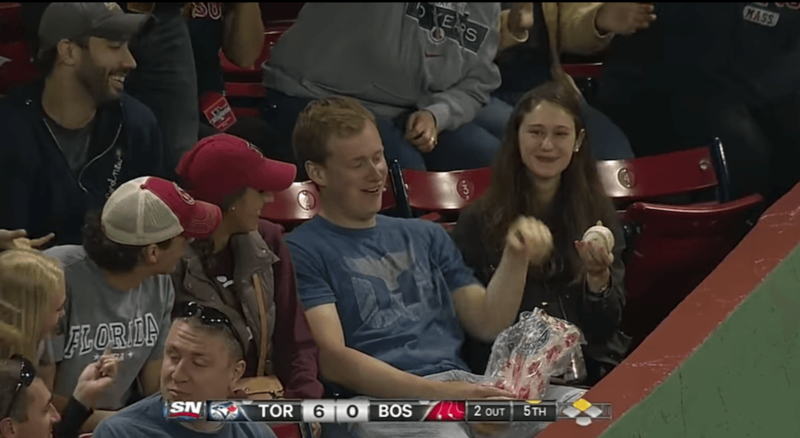 What happened: This has to be the easiest of all the foul ball catches by fans we’ve ever seen. A man sitting down the left field line in Boston doesn’t even have to move as Toronto’s Dioner Navarro hits a ground rule double into the stands. The catch is so easy, the fan just keeps eating his popcorn while catching the ball. What happened: Chris is one of the richest stand-up comedians of all time, and he’s a stand-up guy, too. 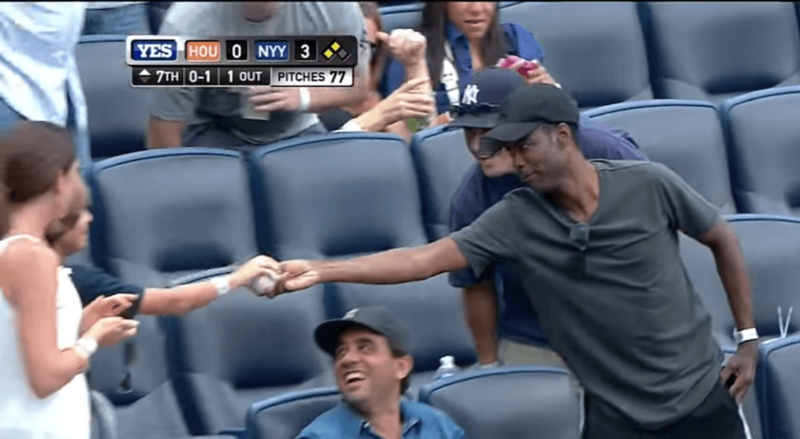 After snagging a foul ball near the third-base dugout in New York, he hands it over to a young fan a few seats down. What happened: Most fans are lucky to catch one foul ball in their lifetimes. 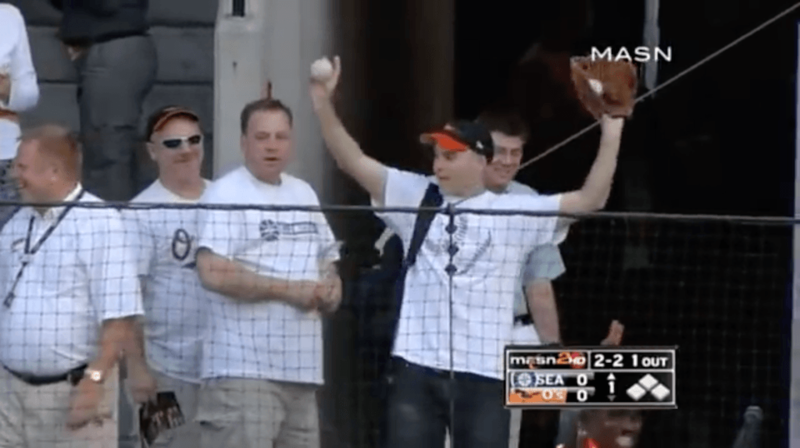 An Orioles fan catches three during one game in 2011. 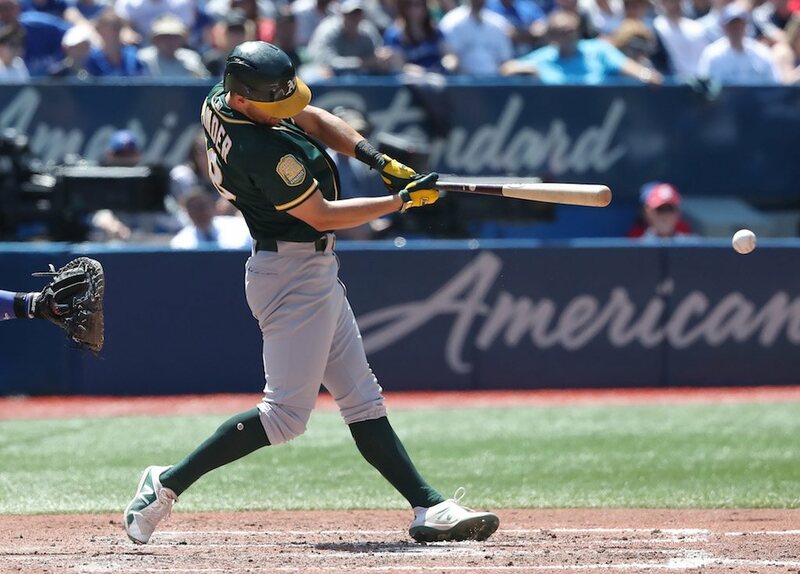 Cruising along a walkway behind home plate, the fan catches two during one at-bat and another one later in the game. He ignores one of the things you should never do at a baseball game by bringing a glove, but we’re guessing that doesn’t matter to him too much. What happened: What would you do if you attended games for years without coming near a foul ball and then catch two back-to-back? Would you high-five everyone within arm’s reach? Well, that’s what one Oakland A’s fan does. He makes barehanded foul ball catches on consecutive pitches, then celebrates with everyone around him. What happened: During a game in Cincinnati early in the season, a pop foul down the first base line drifts into foul territory. 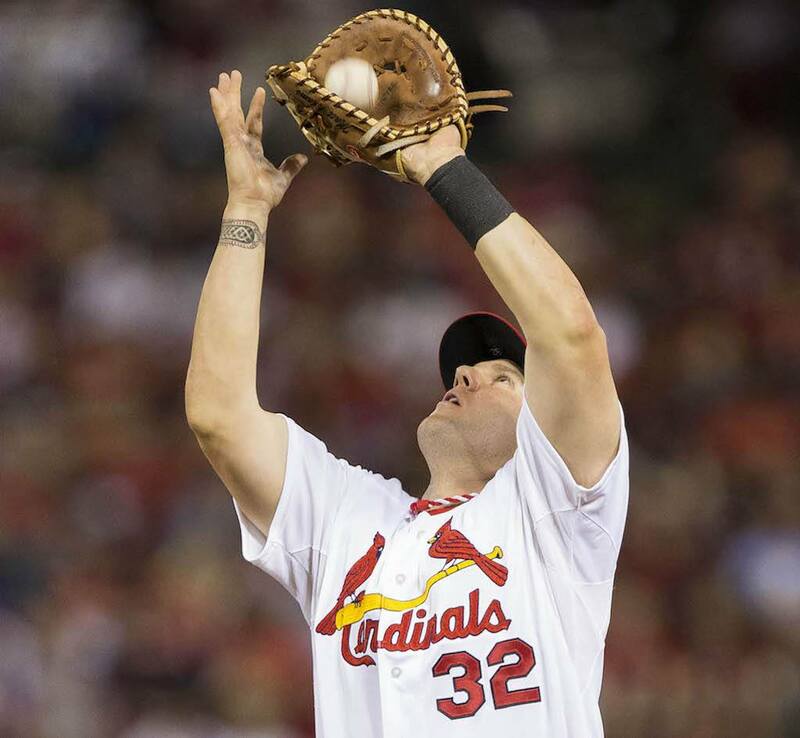 St. Louis first baseman Matt Adams avoids the tarp in his way, but he can’t avoid the three Reds fans in the first row, one of whom makes the catch. Adams gives the fan a little shove with his glove hand before heading back to first base. Maybe he’s ticked that an NL Central division rival fan upstages him with one of the best foul ball catches ever. Next: A rebound and a catch. 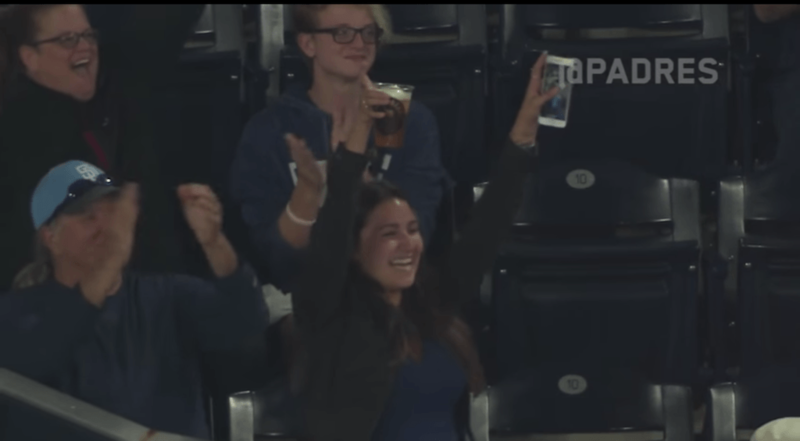 What happened: A woman sitting in the upper deck at a San Diego Padres game has a foul ball bounce off a nearby seat and land in her beer. She shakes off the shock, plays to the crowd for a minute, then drinks her beverage. We’ll see a similar situation in a minute, but we think the next one is a bit more impressive. Next: Two people, two catches, one ball. What happened: So far we’ve seen a ball land in someone’s lap, back-to-back foul ball catches, and a beer cup catch. This one tops all those. A woman in St. Louis opens her purse and puts it above her head to snag the ball, which she does with an off-balance catch. Then, her husband catches her and keeps her from falling over. That’s a catch and then a catch, and both of them are impressive. Next: Don’t waste a drop. What happened: We discussed a recent beer cup catch in San Diego a minute ago, but we rate this one a bit higher for a couple reasons. 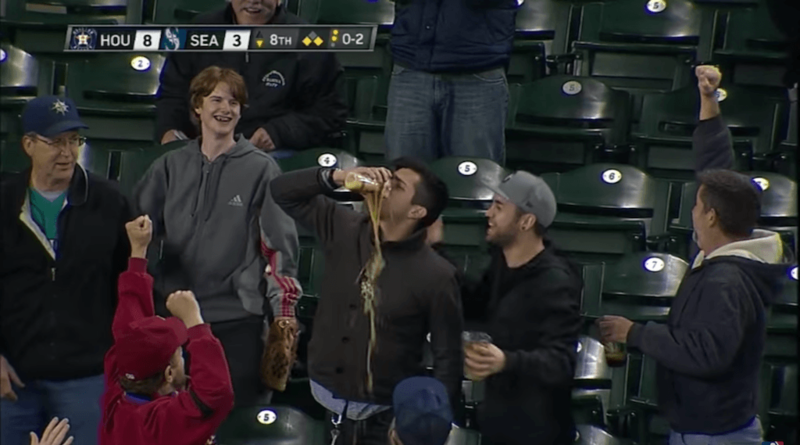 First, the Seattle fan intends to catch the ball with his beer, as opposed to having it get there by chance. Second, he drinks it right away instead of milking it. We’re only guessing here, but he probably didn’t want to waste any of the awesome Washington craft beer in his cup. Next: A fan with the skills of a Gold Glove winner. What happened: The Philadelphia Phillies have extremely loyal fans, and it turns out they have skilled ones, too. 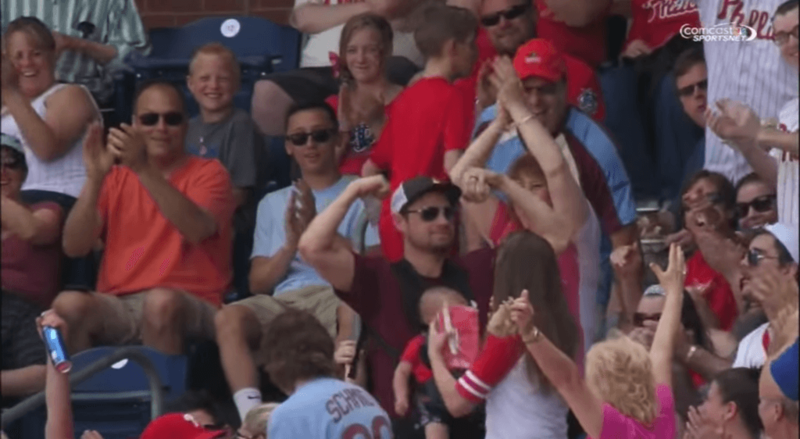 On Mother’s Day in 2015, a man makes a barehanded foul ball catch. What makes it one of the best foul ball catches ever is he has a ticket in the other hand and his baby in a sling on his chest. Next: This is probably the best of all the foul ball catches we’ve seen. What happened: This is very similar to the foul ball catch we just discussed in Philadelphia, but this one is even more challenging. 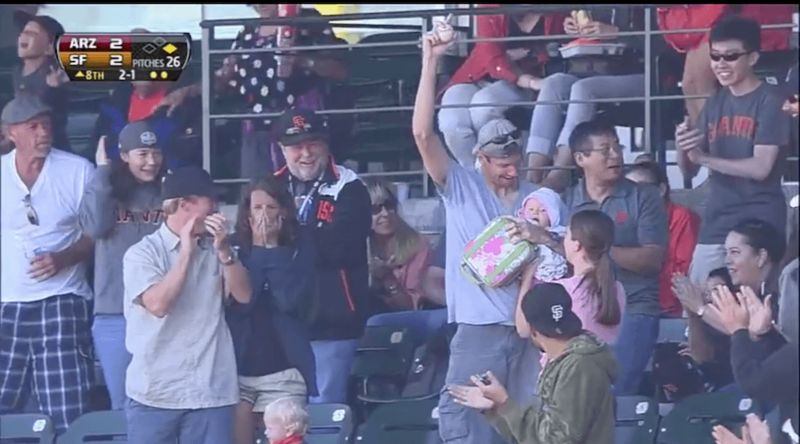 A fan in San Francisco makes a barehanded catch on a foul, all while holding his baby and a diaper bag in the other hand. He makes the catch without dropping the kid or the diaper bag, which is slightly more impressive than the Philadelphia barehanded baby catch.